American Student Assistance® (ASA) was honored to participate in the ninth annual National Mentoring Summit in Washington, D.C. last week. The inspiring conference was convened by MENTOR: The National Mentoring Partnership, with whom we are proud to partner on expanding quality mentorships across the country. As an organization committed to ensuring that young people have the tools needed to make informed choices to achieve their education and career goals, we were inspired by what we saw and proud to join peers in important conversations about how mentors can help guide teens along their journeys toward success. At the conference, ASA® joined more than 1,300 youth mentoring practitioners, researchers, advocates, corporate partners, government and civic leaders and national and local youth-serving organizations. This year’s theme, “Building Relationships, Advancing the Movement,” provided attendees with the opportunity to share practices and highlight critical research. 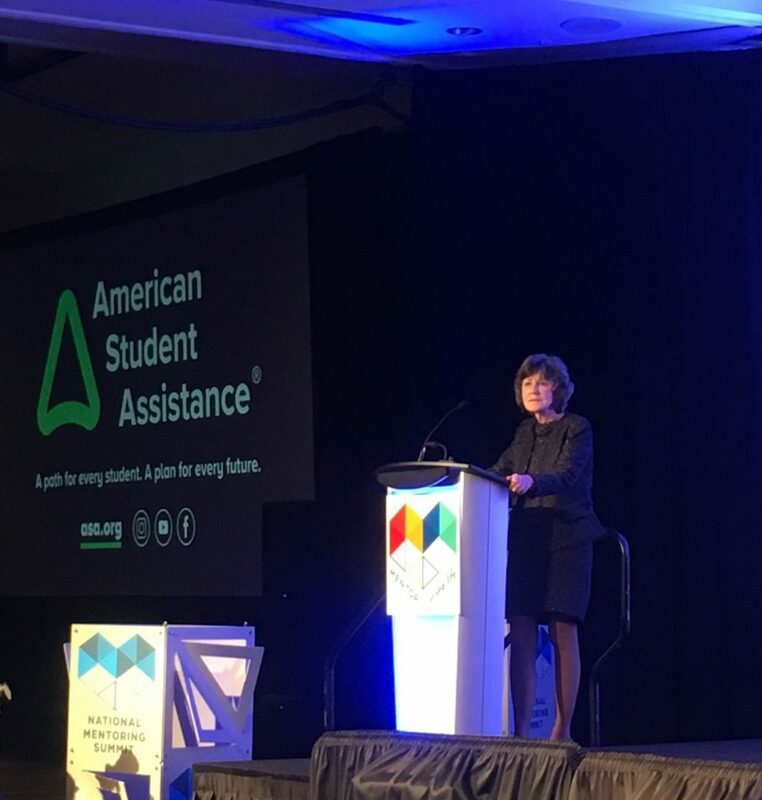 ASA President and CEO Jean Eddy opened the conference with heartfelt remarks to all attendees, thanking the mentors and program leaders for their efforts and acknowledging MENTOR for its continued leadership. She spoke about ASA’s history, our mission to help students plan for their own education and career success, and she called for partnership-building with organizations in attendance to support that mission and help young people achieve their dreams. During her remarks, Jean showed a mashup of the “Shadow” videos on asa.org, which feature real kids shadowing mentors with fascinating jobs. Attendees loved what they saw, and Jean encouraged them to use the videos as conversation-starters with their mentees. If one of the videos inspires a teen to consider a career they hadn’t thought of before, that’s a win for everyone involved. In the spirit of sharing best practices, ASA also presented a session at the conference called, “Early Choices, Lasting Consequences: How Mentoring Helps Students Make Successful Postsecondary Choices.” Kevin Fudge, ASA’s Director of Advocacy, and Neil Swidey of The Boston Globe, shared the approach of the Alray Scholars Program, which combines mentorship, scholarships and financial literacy training to help Boston Public School graduates who withdrew from college get back on track through re-entry to college or completion of a career training program. Participants left the session with concrete steps to build networks of mentors and resources in their communities to help young people explore all postsecondary pathways and chart a course that minimizes risk and maximizes returns. Throughout the conference, ASA staff engaged in productive conversations, and one thing is clear: strong mentoring relationships can play a vital role in helping students know their options and make informed choices as they plan for and pursue their goals. We share MENTOR’s passion and look forward to more opportunities to partner with MENTOR and support this movement on behalf of young people.